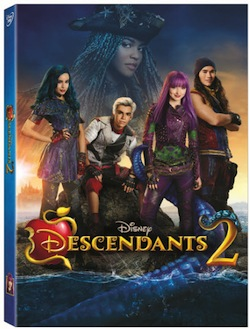 If you have a tween or even a teen, I’m sure you have heard of the movie Descendants. Recently Disney came out with the sequel to the movie. On Aug 15th, you can get it on DVD/bluray. My 14 year old and I watched Descendants 2 when it was on the Disney channel, so we were so excited when we got it on DVD and to be honest, we have watched it a few to many times already. Cast: Starring are Dove Cameron ("Liv and Maddie"), Cameron Boyce ("Jessie"), Sofia Carson (Hollywood Records recording artist, "Adventures in Babysitting"), Booboo Stewart ("X-Men Days of Future Past"), and Mitchell Hope reprising the roles of Mal, Carlos, Evie, Jay and King Ben, respectively. Starring as the new villains are China Anne McClain ("A.N.T. Farm") as Uma, the daughter of Ursula; Thomas Doherty ("The Lodge") as Harry, son of Captain Hook; Dylan Playfair ("Some Assembly Required") as Gil, son of Gaston; and Anna Cathcart ("Odd Squad") as Dizzy, daughter of Cinderella's evil stepsister Drizella and granddaughter of wicked stepmother Lady Tremaine. Also reprising their roles in this sequel are Brenna D'Amico as Jane, the daughter of Fairy Godmother; Melanie Paxsonas Fairy Godmother; Dianne Doan as Lonnie, the daughter of Mulan; Jedidiah Goodacre as Chad, the son of Cinderella; Zachary Gibson as Doug, the son of Dopey; Keegan Connor Tracy as Belle and Dan Payne as Beast. I have yet to see this movie, I will definitely put it on my list.